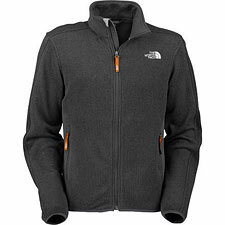 North Face's Miwok Fleece Jacket was love at first sight for me. I liked the Miwok so much I bought it on the spot. What's so special about it? We all know there's really no substitute for fleece when you need it, but if you often find yourself wishing your fleece jacket was a little less like...well, fleece, the Miwok might just deserve a place on your wish list, too. You know what I mean: static cling, sparks, pilling, odd-textured, picking up every bit of dog hair on the planet—I mean, why can't fleece be more like your favorite cotton sweatshirt? Why can't it be comfortable against your skin? Why does it always have to feel like it was made from recycled soda bottles? Ah, here's the thing about the Miwok Fleece: when I first saw it, I thought it was cotton. I'm not alone on this. I spoke to one North Face employee who also thought the Miwok was made of cotton. No—it's actually 100% polyester, an almost magically comfortable blend North Face calls "anti-pilling sweater knit fleece." If you can imagine how wonderful it is to have a technical fleece that looks and feels like cotton, you've got a sense of why I love the Miwok so much. Add in TKA stretch panels on the sides for a trim fit, and you've got the best-looking best-fitting fleece in North Face's lineup. This makes the Miwok a perfect choice for lounging around your living room on a chilly morning. But how about technical performance? What happens when we go outdoors? Here too the Miwok proves to be a surprise. The Miwok's weight is a very modest 18.2 ounces (measured), making this a great choice for ounce-conscious backpackers. For the weight, you get a very warm fleece that serves as a fine inner insulation layer beneath your shell. On its own, be aware that the Miwok's fleece has a very open weave, making it unusually breathable. This reduces the Miwok's utility in windy conditions as a stand-alone jacket. However...if you are climbing, or engaged in any high-aerobic pursuit, like trail running, this enhanced breathability makes the Miwok a must-have. You stay dry and comfortable, even when you're burning toward the summit. And if you do get the Miwok wet, it dries out quickly, no fuss at all. This may well be my all-time favorite for a fleece jacket. Provided you don't need a wind-blocking fleece, you just can't go wrong with this one. Note: the Miwok is discontinued.